A human rights group in Israel has called for the military's chief rabbi to be dismissed for alleged incitement against Palestinians. 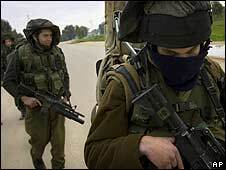 The group, Yesh Din, said Rabbi Avichai Rontzki distributed a booklet to troops in the Gaza offensive, which advised them they were fighting "murderers". The booklet, citing an ultra-nationalist rabbi, told soldiers to show no mercy to a "cruel enemy". The Israeli military has not yet commented on the issue. Yesh Din, which says it is dedicated to defending human rights in the Occupied Territories, called on Defence Minister Ehud Barak to dismiss the rabbi. It said the booklet's contents could be "interpreted as a call to act outside the confines of international laws of war".